Welcome to our review of the Leica Rangemaster CRF 1600-B Rangefinder. Leica is well-known for their fantastic optics, so I was excited to get my hands on the Rangemaster CRF 1600-B for testing. Just how well does an $800 rangefinder stack up against the competition? Is it worth the extra money? Let’s take a look and find out, shall we? The stated range of the Leica Rangemaster CRF 1600-B is 1,600 yards, but that is only to a highly reflective target. With that said, the rangefinder’s ability to give range readings to trees and deer is still quite impressive. I’ve found that I can usually get an accurate reading on a tree from 1,000 yards, and have had little trouble getting the distance to a medium-sized buck from as far away as 700 yards. Accuracy of this rangefinder is average, but not outstanding. You’ll see an accuracy of within 1 yard up to 500 yards, and accuracy to within 2 yards out to 1,000 yards. If you’re ranging an object further away than 1,000 yards, the accuracy is to within +/- 0.5%. This is notable because many less expensive rangefinders are accurate to within half a yard for objects 500 yards away, and accurate to within a yard for objects out as far as 1,000 yards. The Leica clearly fails to compete with those cheapter alternatives. How Easy is the Leica Rangemaster CRF 1600-B to Use? This rangefinder has a number of advanced features, so it can be more complicated to use than the competition if you are taking full advantage of the Leica Rangemaster CRF 1600-B. For simple range measurements, you get one-button operation; when you want more advanced data, you use the secondary button. There was a little bit more of a learning curve for using this particular rangefinder because of the use of the secondary button, but I would still say it is pretty easy to use. How is the Leica Rangemaster CRF 1600-B Powered? Leica powers the Rangemaster CRF 1600-B with a single 3V CR2 battery, and includes one in the package. I have a strong hate-hate relationship with CR2 batteries, because they are next to impossible to find out in the rural areas where I tend to hunt. However, the power consumption on this rangefinder is excellent, and I’ve been able to get more than 2,000 readings from a single battery. Part of this is because the unit powers down 6 seconds after you stop pressing the main button, the perfect amount of time to read the range and then get the rangefinder out of the way so you can take your shot. I’ve also learned to just carry a spare battery with me, just in case. What Features Can I Expect From the Leica Rangemaster CRF 1600-B Rangefinder? The Leica Rangemaster CRF 1600-B’s features start on the outside with some excellent characteristics, continuing inside the unit. The rubber eyepiece cup can be pressed down for use with glasses, or left up for use without corrective lenses. If you need glasses, but just a little bit, you also get diopter compensation to plus/minus 3.5 diopters, so you can adjust the sharpness of the reticule to your particular eyesight. This rangefinder gives you much more information than just the range to your target. With a brief press of the secondary button, you can also get the angle of inclination to the target, the current temperature, and the current atmospheric pressure. 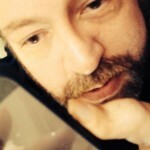 The interior sensors that meausre this information are highly accurate. The Leica Rangemaster CRF 1600-B also has several modes, including modes that take into account the ballistic curve in determining the actual impact point of your shot. You have to set the unit up to your particular ammunition, but the feature works very well once set. You can have the unit return the equivalent horizontal range, the holdover, or the number of MOA clicks required on the rapid reticle adjustment. The Leica Rangemaster CRF 1600-B has fantastic light gathering capabilities, and the LED readout is easy to distinguish in all lighting conditions. The brightness of the LED display is perfect for low light or bright conditions, and the device has never let me down. 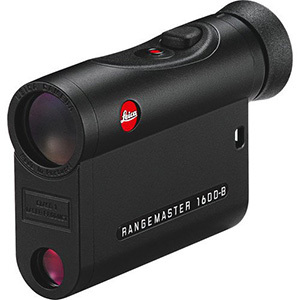 The optics on the Leica Rangemaster CRF 1600-B are fully multi-coated with High Durable Coating and Aqua-Dura coating, and the interior prism has P40 phase correction coating. What this means to you is a sharp, crystal clear image in almost all operating conditions from 14º F to 131º F.
The field of view of the rangefinder is 345 feet at 1,000 yards, which is quite generous and more than enough of a linear field of view to acquire your target easily and quickly. The unit auto-focuses, and does so quite rapidly, allowing you to acquire your target and get its range in seconds. How Durable is the Leica Rangemaster CRF 1600-B? The housing of the Leica Rangemaster CRF 1600-B is made from carbon fiber reinforced plastic, with a soft lacquered finish and cast aluminum interior chassis. The rangefinder is nitrogen-charged, so you don’t have to worry about fogging. Even better, the device is water-tight to 1 yard for up to 30 minutes. This rangefinder can definitely take a beating, and I’ve put it through its paces taking it out into the field on several hunting trips. During one trip, the neck strap gave way while I was climbing into my tree stand, and the rangefinder fell to the ground from about 20 feet. After dusting it off and checking it over, I found the Leica Rangemaster CRF 1600-B still worked just as well as when I first unboxed it. Thanks for reading my review of the Leica Rangemaster CRF 1600-B. This is an excellent rangefinder in all regards. It is a bit less accurate than the competition, but the inclusion of the advanced features like checking the atmospheric conditions make up for that.